Ingredient called catechins in tea which are synergistic with vitamins E and C, Protective against digestive and respiratory infections and can reduce the cancer-promoting actions of carcinogens and ultraviolet light. The antioxidants in green, black, and oolong teas can help block the oxidation of LDL (bad) cholesterol, increase HDL (good) cholesterol and improve artery function. The antioxidant and lipid lowering activities of both extracts from CTC leaf and dust tea was comparable and may be due to the presence of natural products like catechin and others. As herbal teas cannot be composed of any plant material, it should only include scientifically proven time tested herbals. Therefore, so many products in open market including some plants that are known to be toxic, the specific ingredients must be checked for health and safety individually. Most herbal teas sold as beverages untested for safety. But Ayurvedic herbal teas that contain small quantities of herbs that don’t cause damage in any means since they are time tested for over 4000 years and taken moderately. According to Dr. Anil Meta et al., (1999) in this shloka (rhym), Ayurveda is the knowledge of life that gives indication for a wholesome life. The object of Ayurveda is to assist nature and not to disturb the natural process of living or healing. All the therapeutic measures used for cures support the natural process. Serendib Golden Slim Tea is unique blend of Ceylon black tea and Green Tea processed in an ancient Chinese method, with natural slimming agent Garcenia (proven by modern day scientific research). In addition very good quality Ceylon spices including world renowned Ceylon Cinnamon is added to enhance the effectiveness of this unique blend. The high Quality, Freshness and Authenticity is the wholemark of Serendib Golden slim Tea. Taken twice daily (morning and evening after meal). 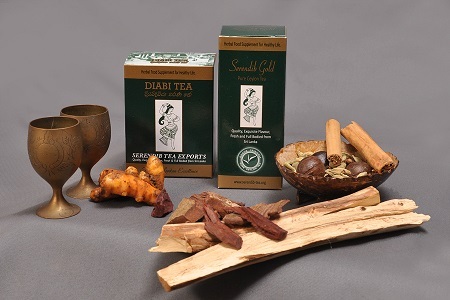 Serendib slim Tea nourishes your insides with our value herbs and natural way to detox and rejuvenate your body. 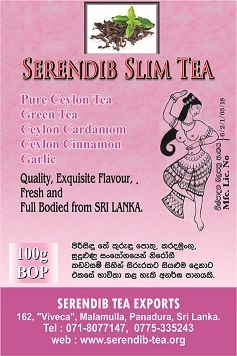 By Serendib Herbal Tea Exports in Ceylon Tea News, Serendib Diabi Tea, Serendib Herbal Tea Exports on January 18, 2013 .